If you have a garbage disposal that's not working we can't help but wonder why. Garbage Disposal Replacement in Tempe, AZ doesn't need to be overly expensive and the difference it makes in how clean your kitchen is can really improve the quality of your life. Even if it turns out you need a garbage disposal replacement it will be worth it in the long run. We're a well established, highly reputable plumbing company. 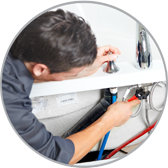 We fix and install garbage disposal units as one of our regular services. This means we won't charge you extra, like some plumbers might, because we're doing something outside of the services we offer regularly. We value our customers and want you to be happy with any work we do for you. Like any plumber we get a certain amount of business because we just happen to be the first people available in emergency situations. We don't take unfair advantage of the misery of others however. No matter when you call us our prices are fair and reasonable and as much as possible we tell you what they'll be ahead of time. Garbage Disposal Replacement in Tempe, AZ is one task that doesn't call for immediate action. This may be another reason so many people put it off so long. Maybe you are one of them. If you are we have something we'd like you to see. Ask to see what our customers have said about the work that we've done for them. You'll find, without exception, their testimonials say we were friendly, fair and did good work It's a reputation we're proud of and have every intention of earning each and every time we do a job. We want to be your plumbing company and know the best way is by always doing good work at fair prices.